This Harry Potter-inspired wizard was so much fun to draw! I used it for my daughter's 11th birthday party, perfect for her "CUTE" Harry Potter theme. Included in the files are the Hedwig owl, and 3 Harrys, each holding their own frame. I have included them with and without the sentiments inside, so that it will be easier for you to type in any quote you'd like! Swish and flick! With this listing, you will receive high quality, originally drawn digital stamps that you can use to create handmade cards, tags, cupcake toppers or whatever else you can dream up! This listing is for an instant download. No physical items will be shipped to you. You may not redistribute, re-sell or reproduce the as-is artwork in any way. 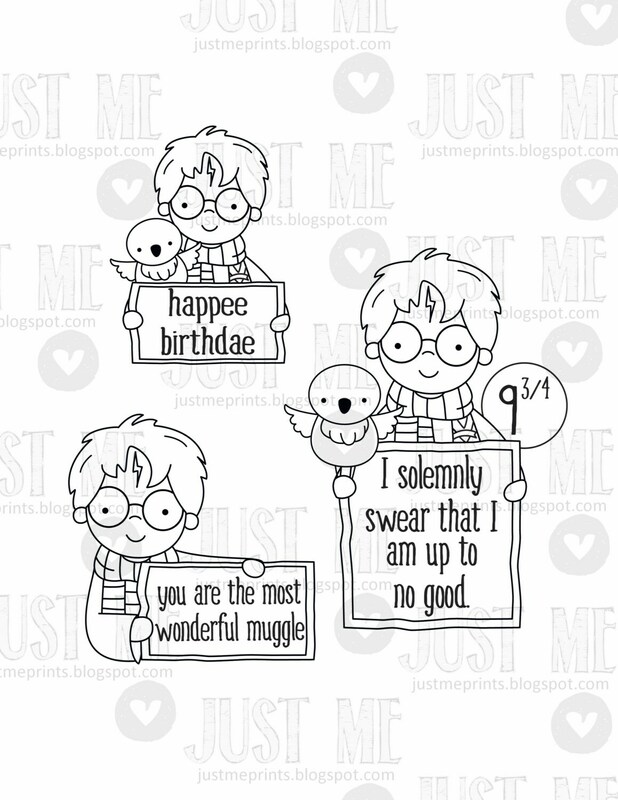 I made awesome little bookplates for my Harry Potter books with these. Because of the digital nature of the products, I will not be issuing refunds. However, if you run into a problem, I will be happy to help! Please message me if you are not satisfied with the product. Please note that you are not permitted to copy or distribute my original artwork files. You are not permitted to sell the original files or claim the artwork as your own. I also do not permit my artwork to be used in an obscene way.